Since the very beginning, women have been part of the Colorado Mountain Club. Many of the charter members were women. As you can see from the following photos, there were always quite a few women on the trips and outings. It was not uncommon for women to outnumber the men. 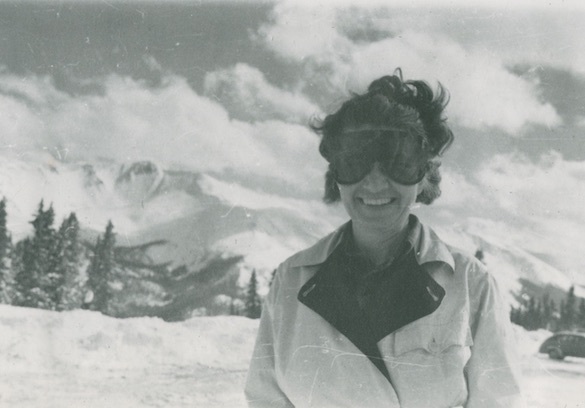 Eleanor Davis (later Ehrman) was a member of the Colorado Mountain Club and the first Colorado woman to join the American Alpine Club. Davis taught physical education at Colorado College and made the first ascents of the Crestone Needles in 1916 as well as being the first woman to climb Grand Teton. She also completed the second ascent of Mount Wilbur in Glacier National Park. 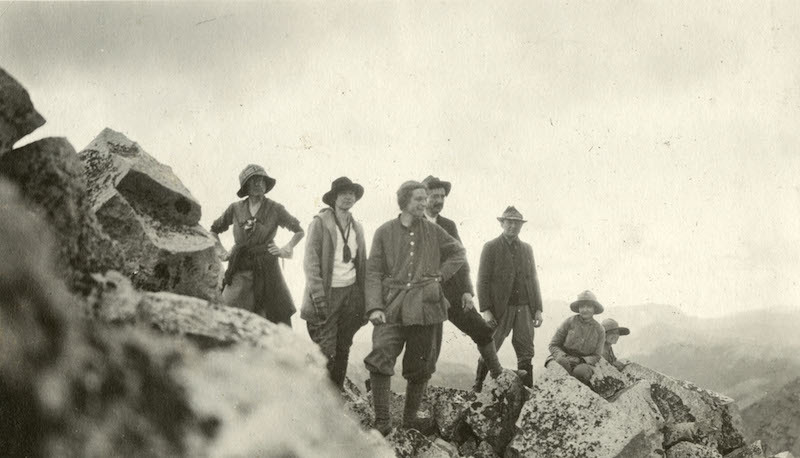 Eleanor Davis (seated) and Eleanor Bartlett (standing) on an outing to Sentinel Peak, 1921. Born in Denver and educated at Smith College, Agnes Vaille was an early member of the Colorado Mountain Club. She served as Outing Chairman and went on scouting trips, often as the only women in the group. She was also a member of the "14,000 Footers Club" and well on her way to becoming the first woman to summit the Colorado 14ers at the time of her untimely death. She was the first known woman to make a winter ascent of James Peak in 1923. In addition to mountaineering, Vaille volunteered with the Red Cross in France during the First World War and was appointed secretary of the Denver Chamber of Commerce in 1924. On January 25, 1925, Vaille and fellow CMCer Walter Kiener made their fourth attempt to climb the east face of Longs Peak. Though they were successful in summiting, Agnes died on the descent. The Agnes Vaille Shelter was built on Longs Peak and Agnes Vaille Falls near Buena Vista, Colorado, was named for her. Mary Cronin was born in Denver to a working class family. By the age of 17, she was a clerk at Western Union. She joined the Colorado Mountain Club in 1921 and climbed her first Fourteener, Longs Peak, on a trip led by Agnes Vaille. Frequently partnering with Vaille, Cronin went on to become the first woman to summit all of Colorado's Fourteeners (14,000-foot peaks). By 1926, she was serving on the Board of Directors, Membership Committee and as a Trip Leader. In 1934, she climbed her final Fourteeners: Mt. Oxford and Mt. Belford. She remained active with the CMC until around 1937, when her job with Western Union was transferred out-of-state. She lived to a ripe old age of 88. A peak in the Sawatch Range of Colorado now honors her achievement: Cronin Peak is 13,877 ft.
All photos by Luke Allen Humphrey.